In the world of fine maritime art, particularly Titanic art, his name is well known. 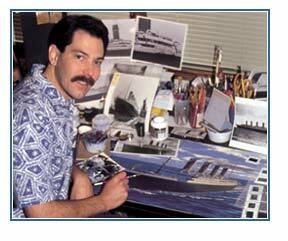 In fact, Ken Marschall is globally recognized as the world's leading Titanic artist. Having first been commissioned to paint the legendary liner at the age of 18, in the last three decades he has meticulously portrayed this most famous of ships over one hundred times, along the way amassing one of the largest and most complete archives of Titanic and related reference photographs anywhere. Ken's painting style is almost a lack of style  historical "portraits" so intricate in detail, so accurate, so breathtaking in their lighting and drama, that they are sometimes mistaken for photographs. His works are represented in many notable collections including the National Geographic Society and the National Portrait Gallery, and his Titanic paintings have appeared in numerous books and on the covers of both Time and Life. The artist's haunting work in the best-selling book Titanic: An Illustrated History inspired Writer/Director James Cameron, and its influence can be seen throughout Cameron's stunning motion picture TITANIC. Ken's incredible familiarity with the ship's every detail earned him Cameron's choice for Visual Historian on both that film and his astonishing 3-D large-format movie Ghosts of the Abyss. Trans-Atlantic Designs, Inc., is proud to be your direct source for fine-art and limited edition prints, posters and other quality products featuring the highly acclaimed work of Ken Marschall and rare images from his personal photographic collection.